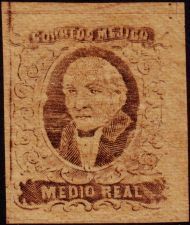 All medio real stamps were printed from plate III. All un real stamps were printed from plate IV. 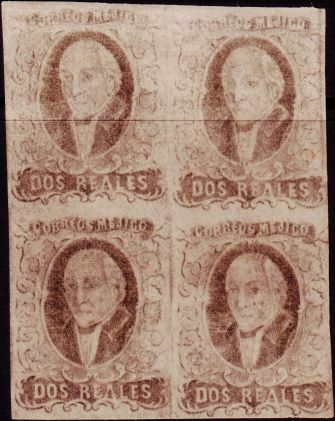 All dos reales stamps were printed from plate III. All cuatro reales stamps were printed from plate II. All ocho reales stamps were printed from plate I.
Medio real: black / orange buff and gray-black / brown. Un real: (jet-)black / green and gray-black / green. Dos reales: (jet-)black / rose and gray-black / rose. Cuatro reales: black / yellow, gray-black / yellow and dull rose / yellow. Ocho reales: black / brown and green / brown. The reason for using two distinct colors for the cuatro and ocho reales stamps is unknown. An article in Mexicana April 1996, by Roberto Liera ("The High Values of the 1861 Issue") contains possible explanations. 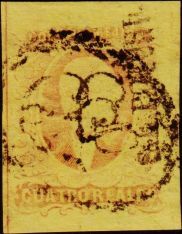 Approximately 40% of the cuatro and ocho reales stamps are believed to be in the "new" colors (dull rose on yellow and green on brown). Only the larger districts received high value stamps in both colors. The smaller districts did not receive stamps in the "new" colors. For now, only a few stamp images are presented. Eventually, these pages will be expanded to cover this issue in greater detail. However, this will be a work in progress for a long time! Now you're warned. Between 1861 and 1864 there were 48 districts, which overprinted their stamps. In addition, 5 Mexico sub-offices and one Veracruz sub-office received direct shipments of stamps. Four sub-offices received Direct Emergency Shipments. Only Tuxpan was a sub-office of Veracruz, the others were under Mexico. Medio real, unoverprinted. Showing top frame line and die mark at left (plate III, pos. 2). Dos reales, unoverprinted. Block of four. Cuatro reales, San Luis Potosi. Cancel Sz1454, with left frameline. 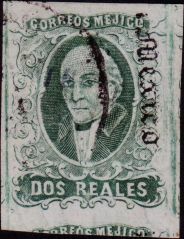 Dos reales, Mexico Gothic overprint, bluish green with R.P.S. watermark.